Congressman Sam Farr (D-CA), a fifth-generation Californian, represents the state's beautiful Central Coast. Throughout his 18-year tenure, Mr. Farr has been a leading advocate for California agriculture, an outspoken activist for affordable housing and a champion of the oceans. In Congress since 1993, Farr serves on the powerful House Appropriations Committee, which oversees the distribution of the federal budget. 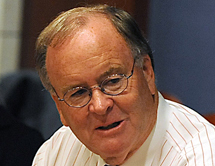 Farr is the Ranking Member of the Appropriations Subcommittee on Agriculture, Rural Development and Food and Drug Administration, as well as sits on the Subcommittee on Military Construction and Veterans Affairs. Mr. Farr co-chairs the Congressional Organic Caucus, Congressional Travel & Tourism Caucus, Defense Communities Caucus, House Oceans Caucus, and Unexploded Ordnance Caucus.